Rather than spending decades coordinating on farecards and behind the scenes payment technologies, transit agencies, and other organizations with their own currency, should join the rest of the world and just use standard modern payment technologies. Not special edition MasterCards. 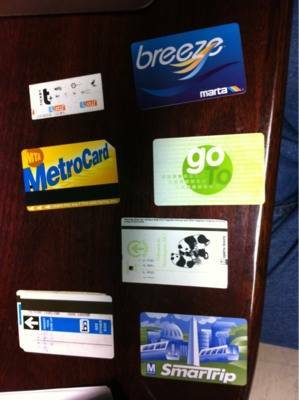 Not new consortiums of region-only standardized fare cards. Use soon-to-be run of the mill NFC-enabled smart phones, cash, and credit cards, i.e. the common forms of money already in our wallet or on our person. But for all of our sake, do it off-board. We have credit-card-able parking meters throughout Minneapolis now. Any location worthy of being served by fixed route transit should be worthy of an off-board fare-collection mechanism (to speed boarding), as ubiquitous as modern parking meters, which can take cash, coins, pin-and-chip credit cards, and NFC. One for every bus stop. If the bus stop doesn’t justify the capital investment of a pre-payment machine, maybe it doesn’t justify fixed route service, and some form of demand-responsive transportation (paratransit, “ridesharing”, etc.) is warranted instead. Modern parking meters cost about $500 to $5000 to install (depending on which article you believe and the technology). Assuming bus stop collection would be similar, at 12,000 bus stops, that would be $6 million – $60 million (and let’s assume they last 10 years). Of course there are too many bus stops as well. And someone will complain they really cost more because of some obscure standard. However for even $60 million we would speed up bus boarding significantly. If Metro Transit had 70,000,000 bus riders per year (not quite) for 10 years, that is 700 million rides to spread the costs over, or $0.09 per ride. If I am on a bus with 20 other people boarding before I alight (I pulled these numbers from thin air), and every person saves 5 seconds per boarding with pre-payment and all-door boarding (also thin air) (all-door boarding saves at least 1-2s per boarding if there are no alightings, pre-payment speeds this further by up-to 3s per boarding), that’s 100 seconds per trip in personal costs per rider. At $15/hour = $0.00416/second, I save $0.41 per ride. $0.41 >> $0.09 so this is surely worthwhile from a transportation economics perspective, not even considering lowered bus operating costs from an agency that can move its buses faster without on-board payment delays, and reduced costs of on-board fare collection. The faster buses will attract more riders, and thus spread the fixed costs even more widely. Pre-payment then requires proof-of-payment on-board or pre-boarding enforcement somehow. That enforcement should be self-funding if not profitable, as if the enforcers are not raising even enough to pay their own costs, the system is over-enforced.